The River Platform for Monitoring Erosion (RIPLE) architecture has been defined to enable continuous and high frequency (~ 10 min) monitoring of water and sediment (fine and coarse) fluxes in mountain rivers. The main scientific objectives are to: (i) contribute to the establishment of mass balances for water fluxes and sediment transport (fine and coarse); (ii) focus on the fine sediment physical properties (size, shape, composition) in order to provide information on their spatial origin and their potential to fix other substances (nutrients, metals, microorganisms …) and also to quantify the conditions of erosion, transport and sedimentation in the river. 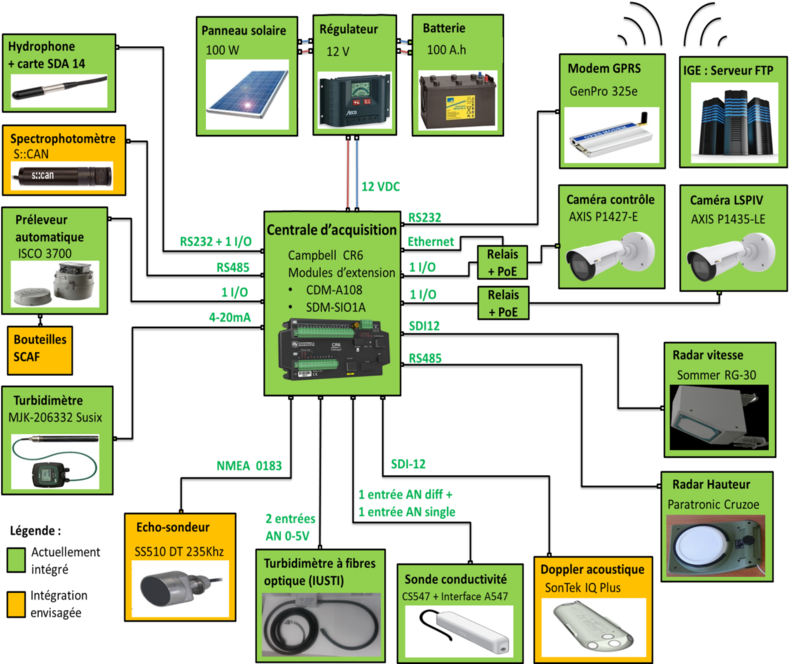 The general architecture of the platform (Figure 1) integrates the following instruments controlled by a single acquisition system: radars for measuring water level and velocity, turbidimeters, conductivity probe, hydrophone (Geay , 2013), cameras, automatic water samplers and echo sounder. For the design of the platform, priority has been given to non-intrusive instruments because of their robustness. A wireless telecommunication has been set up to allow remote interactions with the platform and data transmission. The RIPLE platform has been designed to facilitate its use and maintenance. A user interface (Figure 2) allows data monitoring, remote configuration and sending of alerts (SMS, mail) according to programmed conditions. Other instruments will be progressively integrated, such as SCAF (Wendling et al., 2015), an acoustic Doppler profiler and a spectrophotometer. The flexibility of in situ installation and autonomy in energy make it easy to move the platform from one site to another. The platform was installed on a bridge of the Romanche River at Bourg d’Oisans (45.1159 ° N, 6.0135 ° E), in September 2016, for a trial period of about one year (Figure 3). This site was chosen because of its proximity to Grenoble and its scientific interest: mountain river with transport by bedload and suspended load, diversified sources of sediments within the catchment, isolated site, presence of a hydrometric station EDF with a stage-discharge rating curve available. 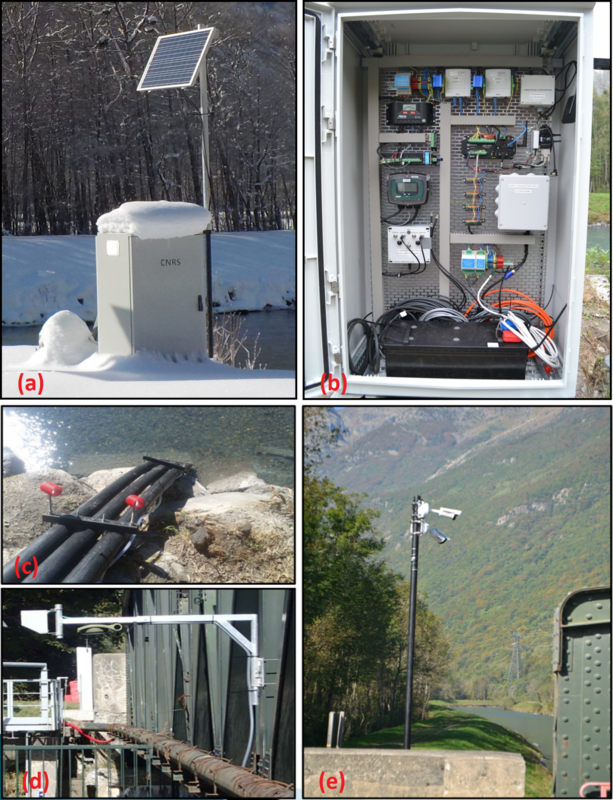 Figure 3: Installation of the RIPLE platform at Bourg d’Oisans: a) Solar panel, b) Cabinet containing electronics and battery, c) Protection tubes for immersed sensors, d) Radars measuring surface water velocity and water level and e) Control camera and camera used for the remote measurement of the surface water velocity. Geay T. (2013). – Acoustic measurement of sediment transport by bedload in rivers. PhD thesis, Grenoble Alps University, 163 p.
Wendling V., Gratiot N., Legout, C., Droppo I. G., Coulaud, C., Mercier B. (2015). – Using an optical settling column to evaluate suspended characteristics in the free, flocculation, and hindered settling regimes. Journal of Soils and Sediments 15, pp 1991-2003.